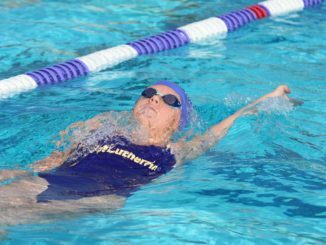 (Thousand Oaks, Ca) The Cal Lutheran Kingsmen claimed ten events in Saturday’s home finale, narrowly edging out the Occidental Tigers 152.50-140.50 inside the Samuelson Aquatics Center. Amongst the morning’s lane victories, the Kingsmen honored its four graduating seniors: Jack Kirby, Connor Donohoe, Jack Hartwell and Mark Raybukh. “The difference between winning and losing the entire meet was one close finish. We had several wins that came down to the touch,” said head coach Barry Schreifels. The men got the competition going early, claiming first in the 200-medley relay behind a 1:33.03 from freshmen Miles Gaitan and Nathan March and sophomores Andreas Nybo and Nick Kenny. Gaitan went on to additionally claim first in the 100-back (54:04) and 200-back (1:57.93). The rest of the relay team also made their own marks on the competition. March took first in the 200-breaststroke (2:12.46) and second in the 100-breaststroke (1:02.14). Nybo took first in the 100-butterfly (52.04), first in the 200-butterfly (1:55.31) and third in the 100-free (48.69). Rounding out the quartet, Kenny pick up first in the 100-free (48.07) and second in the 50-free (22.10). Just behind Kenny in the 50-free, junior Liam McCallum took third, touching the wall just .02 second later at 22.12. He also claimed second in the 200-free at 1:47.28. Also in the 200-races, freshman Vincent Hemingway took third in the 200-breaststroke (2:19.88), junior Thomas Hamburger finished third in the 200-butterfly (2:00.13) and sophomore Kye Daniels closed with third in the 200-back (2:01.47). Moving into the longer distances, junior Ben Brewer took first in the 400-individual medley (4:14.62) and was followed by Hemingway in third (4:22.52). Brewer also went back-to-back with sophomore Stephen Blaauw for first and second in the 500-free and 1000-free. Brewer and Blaauw recorded a 4:44.65 and 4:47.41 in the 500, respectively, and a 9:45.09 and 9:50.10 in the 1000. Coming down to the final events, the Kingsmen sealed the victory over the Tigers with their performance in the 400-freestyle relay. Coming in second and third, Kenny, McCallum, freshman Andrew Meneses and Gaitan recorded a 3:17.45 and were followed closely by Hamburger, Daniels, Hartwell and junior Chase Ahrens at 3:20.07. 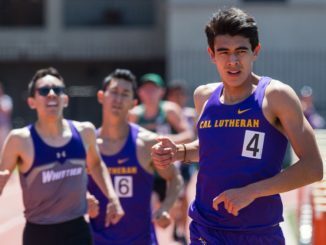 The Kingsmen continue their season in a conference tri-meet against Claremont-Mudd-Scripps and La Verne on Saturday, February 2. Events kick off at 10:30 am at the Matt M. Axelrood Pool in Claremont, California.